Hidden amongst a grove of mature trees Hearnsbrook House has stood on the outskirts of Killimor for almost 200 years. 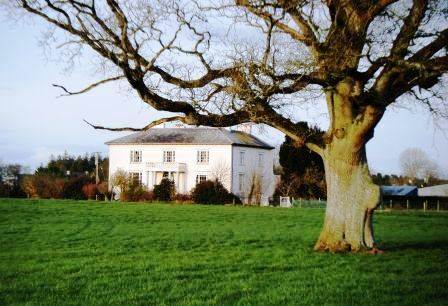 A lesser known, middle sized country house and estate, Hearnsbrook is located approximately half a mile from Killimor village and about six miles from Portumna. The gates, both single and double, are separated by Ashler piers and details on the cast iron railings include a recurring shamrock, rose and thistle motif. The hinges on the double gates were designed as large fisted hands. Hearnsbrook House, a visual symbol of wealth, was built circa 1820 and it is believed that its construction was commissioned by Edmund Hearne, who was the land owner at the time. Hearnsbrook House is a cut-stone building with a rendered lime façade. The front door is approached by long broad steps and has a surmounted semicircular fanlight. A document from 1863 described the house as a Mansion-house which contained four public rooms, seven family bedrooms and every other accommodation for a large establishment. Tripartite sash windows are to be found throughout the house and the glass used in the window panes was spun glass or crown glass. Containing many small rooms, storage and living quarters, the basement of Hearnsbrook House covered a large area and would have been a hive of activity in times gone by and reminds us of the Upstairs/Downstairs situation prevalent at the time. The basement had many hallways, interconnecting rooms and a kitchen, cellar, cool room, pantry and laundry. A two storey section to the back of the house provided some of the servants’ accommodation and access points to the main house. Interior bell buttons were situated throughout the house and were connected to bells in the basement which rang to gain the attention of household staff. Other staff on this estate would have included a steward or land agent, a gate-keeper, a butler, a gardener, a coachman and labourers. Some of the land on this 2,000 acre estate was leased out to tenants who paid their rent in money or in kind. A detailed history of Hearnsbrook House and Estate can be found in our publication “Killimor Our Parish and Our People” Chapter 6, Written by Ann O’Toole.